We raced across the Med to be the first cruise ship in harbour so that we could tie up dockside rather than use tenders as the other ships had to do. The Marina was filled with colourful fishing boats and modern cruisers. The skies were overcast with the sun shining in the distance. Because most of the shops were still opening when we arrived we stopped into Katerina's bar and restaurant for espressos and wifi. 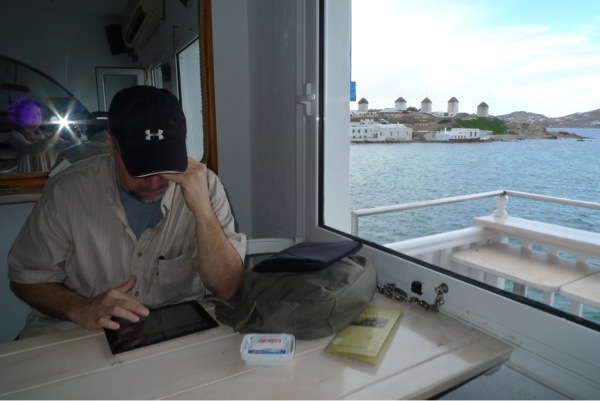 Posted photos from Rome and Egypt while overlooking the harbour and avoiding the early rains (hoping they would pass). Donned my rain jacket and walked the narrow paths until we discovered Joanna's linen shop, where she designs and makes beautiful garments. Pamela found two lovely linen dresses and Joanna gave her a complementing scarf. Joanna shared with us her family's five generation history. Stopped in Hibiscus bakery for feta pie and baklava...delicious. 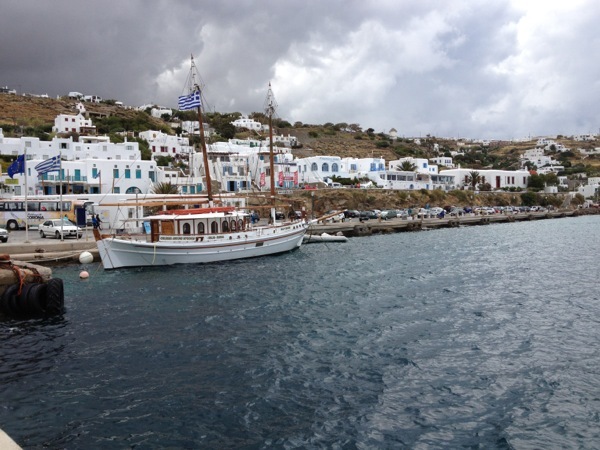 The rain continued but walked all the streets we could before returning to the ship for an early departure. We look forward to returning here for an extended stay to wander the maze of streets.